ChipIn, a free widget based service that enables users to collect money has launched a Facebook application that brings micropayments to Facebook. ChipIn on Facebook supports existing Facebook events or can be used separately with ChipIn created events. 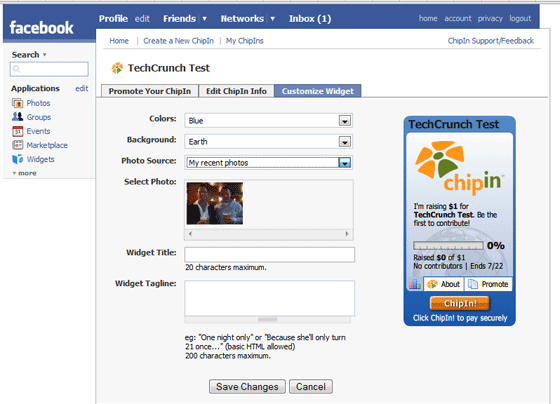 Creation of new “ChipIn’s” is simple, the ChipIn Widget can be customized using photos from a users Facebook account and each ChipIn can also be promoted directly to Facebook friends. We covered Lending Club, the exclusive Facebook P2P lending service on June 20; ChipIn is at the other end of the spectrum targeting micropayments, yet together they demonstrate the continuing growth of finance on Facebook. There is any number of new Facebook applications being launched daily, and whilst many provide a wow factor and are useful, not that many to date have a real world financial use. It’s not too farfetched to imagine ChipIn being used as a political or charity fundraising tool on Facebook in the near future.